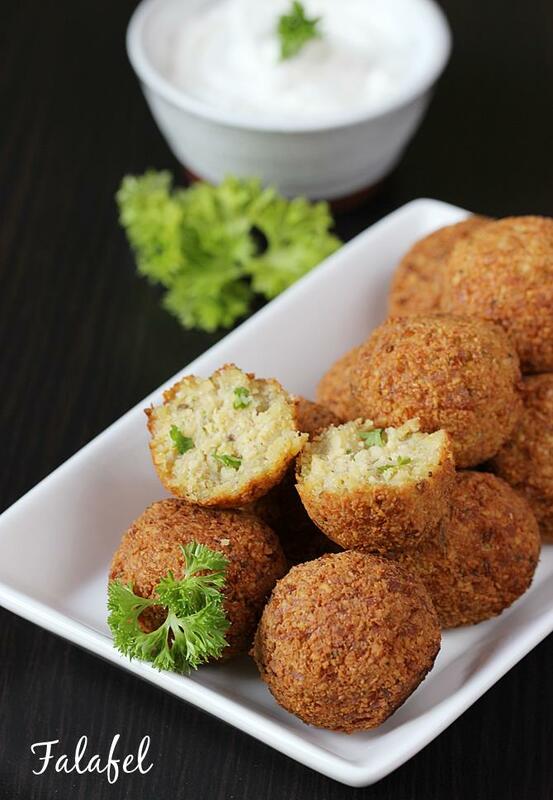 Falafel are deep fried balls from middle eastern cuisine that are served as a snack or as a part of meal. These are made using chickpeas or fava beans or a mix of both. There are many ways of enjoying falafel. Apart from being served as a Snack they are also used as a stuffing inside a pita bread. They are served along with pickled vegetables and Tahini sauce. 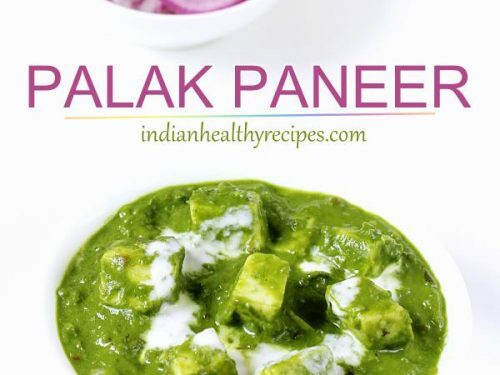 The recipe shared here is a traditional one which is made from scratch with dry chick peas. The traditional version doesn’t use cooked or canned chickpeas. However if you are specific about using canned chickpeas, then you may still go ahead. They turn out good that way too. 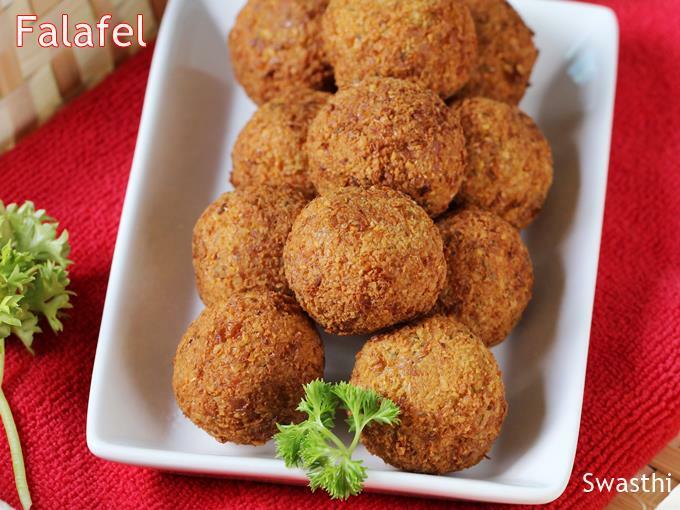 Since falafel is made using high protein legumes they are quite popular as a replacement to meat based snacks across the world. For a healthier option these can be baked instead of deep frying. These are quite easy to make as there is not much cooking involved. 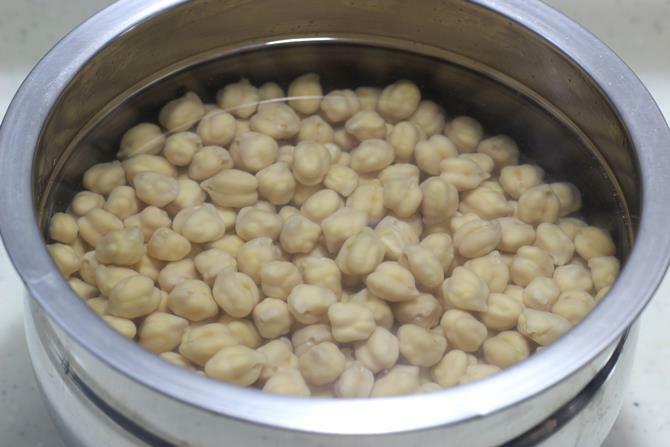 Chickpeas are soaked over night and then ground coarsely along with other ingredients. 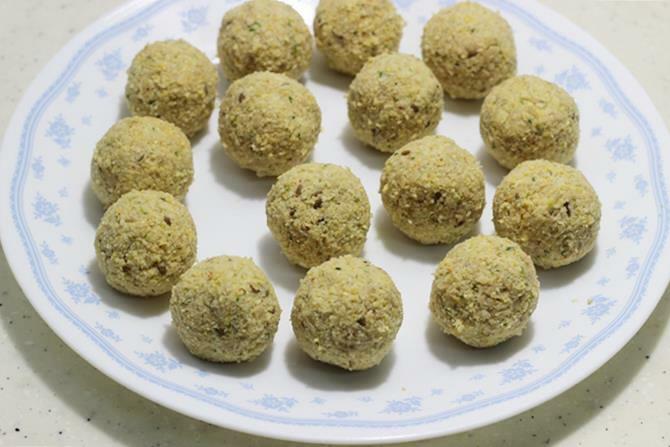 Small portions of the mixture are shaped to balls. However they can also be flattened and fried or baked. 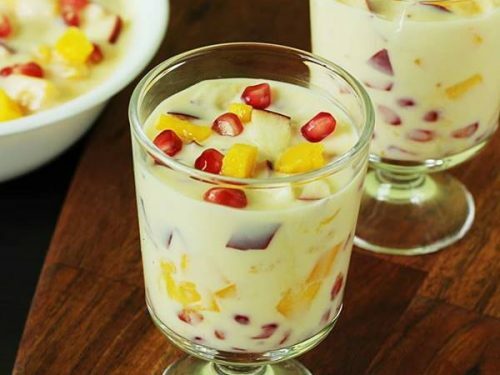 The ground mixture can be refrigerated as well for about 3 to 4 days and used. I have been making these for the past few years following this recipe from Tori Avey. These have been a great food for my kids and hence thought of sharing it here. I blend the mixture in slightly a large quantity and refrigerate. Bake them the next few days for the kids snack. They also go well in the lunch box or sometimes we eat even for breakfast. Since they are protein packed they are healthy if baked. 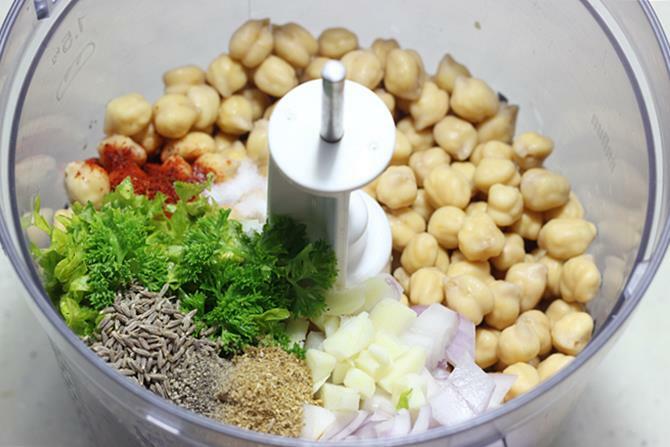 To make falafel chickpeas, spices and herbs are ground to a coarse texture. A little amount of flour is used for binding. I do not use flour hence process it a bit more. Adjust the texture to suit your liking. Making it very coarse will need flour otherwise the balls or patties will fall apart while frying or baking. 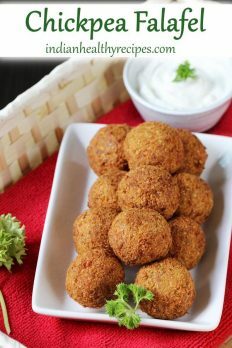 Falafel are vegetarian chickpea snack from middles eastern cuisine. 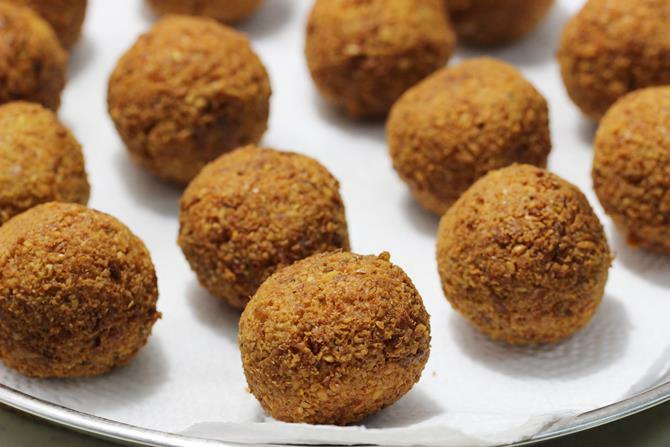 This recipe helps you to make the best falafel. Serve with tahini sauce or stuff inside pita bread & enjoy. Wash and soak chickpeas for overnight. Discard the water and rinse them well. Drain them to a colander. Process together chickpeas, cumin, coriander, pepper, cayenne, salt, onion, garlic, parsley and flour to a coarse mixture. Refrigerate for an hour. Heat oil in a deep pan just enough to half immerse the falafel. The trick i found to prevent the falafels from disintegrating is to use oil just enough to half immerse them. Make a very small ball and drop it in the hot oil for checking if it is binding well. They should not break or fall apart. If they break, then add more all purpose flour or process the mixture a bit more. Make lemon sized balls. If you have added flour then you may slightly flatten them. Deep fry them in hot oil on a medium flame until golden. 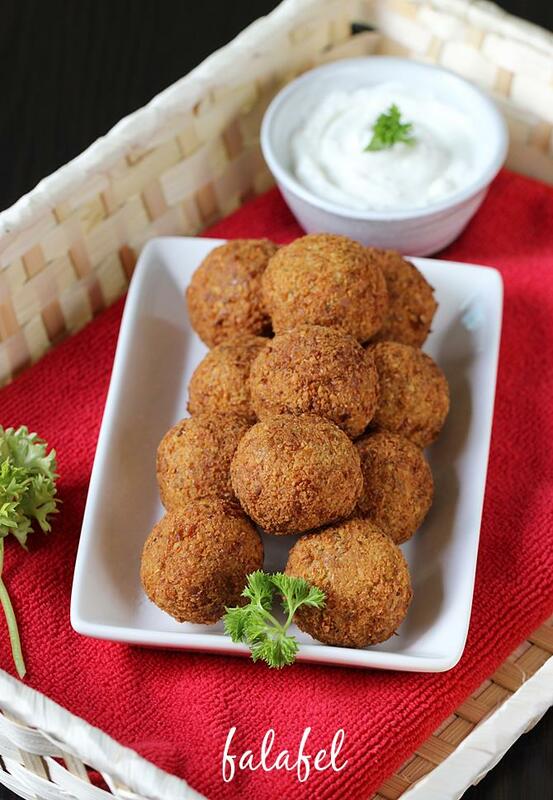 Serve falafel with favorite dip or as a stuffing in pita. 1. Wash chickpeas thoroughly under running water. Soak them for 8 hours in a large bowl with lot of water. Do not cover the bowl. 2. Rinse them well and drain them completely to a colander. Then transfer to a blender or a processor along with chopped onion, garlic, corainder powder,cumin, pepper powder,salt and parsley. 3. Process it until it reaches a coarse texture. No water is added. Take a small portion of this mixture and try to make a ball. 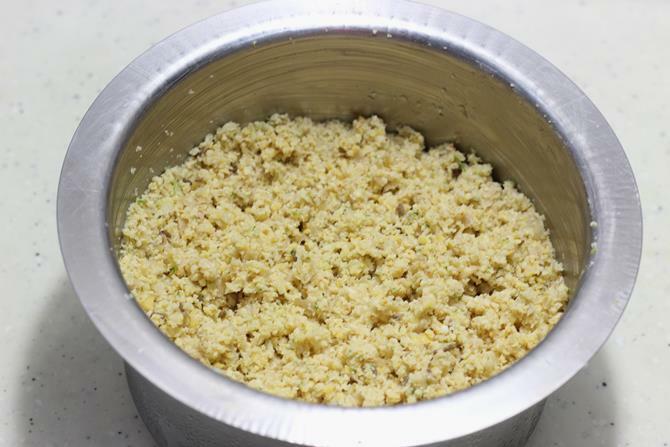 The mixture should bind well otherwise it may fall apart while frying. You may process it more or less until it binds well. But the texture must still be coarse. Also using 2 tbsp of all purpose flour helps to bind it well. Since i did not use flour, i had to process it to a less coarse mixture. 4. Refrigerate for an hour. Take small portions and make balls. If using flour, you may flatten them a bit otherwise they tend to break while frying. 5. I used up half of the processed mixture and then refrigerated the rest for the next day. 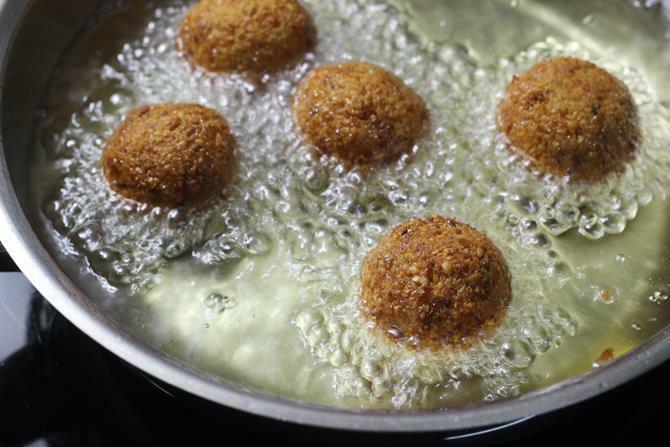 To make baked falafel, I add 1.5 tsp baking soda to a tsp of water. Stir and then add it to the mixture. Knead it a bit and then make thick patties. Bake in a oven at 200 C for 12 minutes on each side. 6. Heat oil in a fry pan on a medium flame. Next make a tiny ball and drop it to check if the oil is hot. It must float and not sink. This means the oil is hot enough. The ball also should not break. If the ball breaks then, you may need to process it a bit more or add more all purpose flour. Do not over heat the oil. As they may brown the balls without frying them inside. 7. Lastly when they are golden fried, drain them on a kitchen towel. They do not absorb oil. 8. Serve falafel with a tahini sauce or your favorite dip. To make tahini sauce – I used ¾ cup tahini, 1/4 + 2 tbsp warm water, 2 large garlic cloves, 2 tbsp. lemon juice, salt as needed, 2 tsp finely chopped fresh parsley. Process all the ingredients in a processor until pale, creamy and thick. To make a quick yogurt dip, use ¾ cup greek yogurt or hung curd, 1 tsp lemon juice, salt, 1 garlic clove, deseeded green chili (optional). Blend them and add parsley. Hi there! 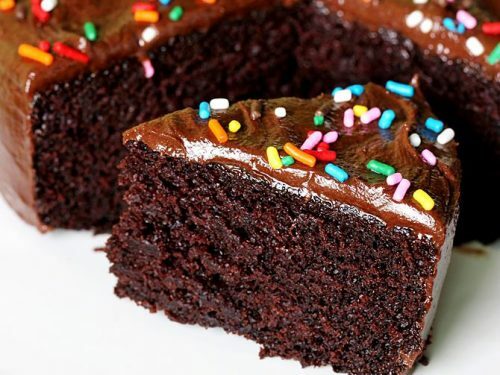 thanks so much for this amaizing recipe. I have a doubt about the nutritional information. is it 190 cal per ball? and how many falafels would you serve per person? Thanks! You are welcome. It is 92 cal per ball. I rechecked it. You can serve about 4 per person. Regarding the nutrition: it is just an approximation as the amount of oil that is absorbed by falafel is unknown. So I just calculated that each falafel absorbs about 1 tsp oil. About half a cup for the entire recipe but actually they do not absorb so much oil. So they may be lesser than 92 cal. Hope this helps. Thanks so much for this wonderful recipes site. I have been trying your recipes of late and they always come out great just like in your pics :). Thanks to your easy to follow step by step instructions with stunning pictures to add to the detail. Your way of explaining is what compels me to try the recipe without a second thought :). 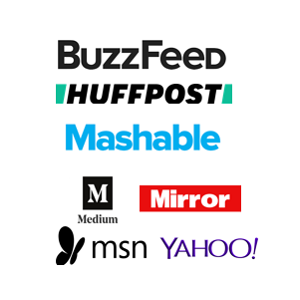 Thank you and keep posting! Best wishes! You are welcome. Very happy to know the recipes are useful. Thanks a lot for the comment. 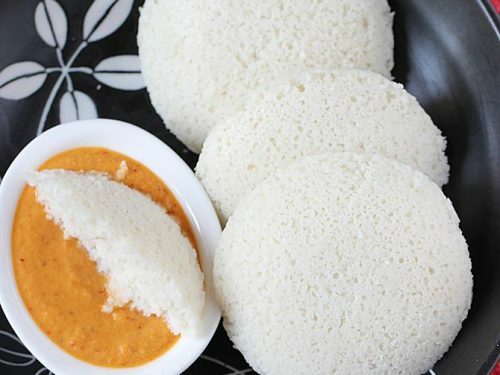 Hi Swasti, I’m very glad I found this recipe. 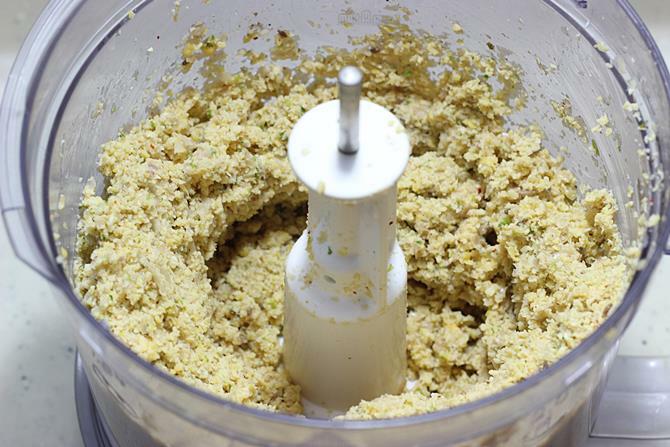 I’m such a huge fan of falafels and have always imagined making them must be tedious. But not so anymore though. It’s much similar to our parupu vada. Very excited to try this though. 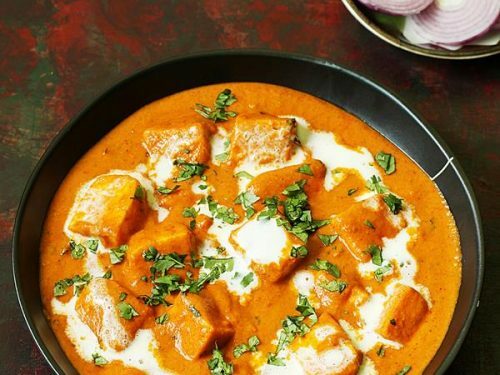 In the recipe you have mentioned this can be baked instead of frying. how do you bake them? For how long? Do you sprinkle oil on top etc. Pls can you share those details. Thank you. You are welcome. 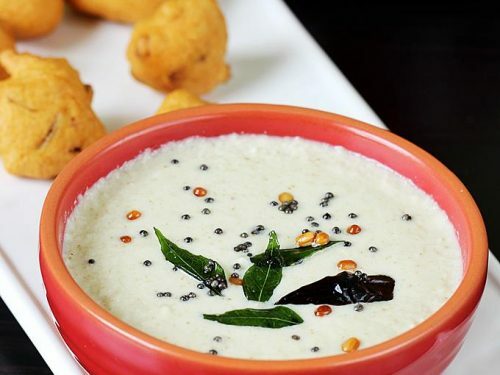 Yes similar to the paruppu vada. Yes I bake these at 220 C in a preheated oven for 12 to 15 mins. I flatten the balls a bit, not much otherwise they will fall apart, grease a wire rack with oil and then place these over the rack and bake. After 12 to 15 mins, I brush them lightly with oil or ghee and then flip and bake for another 4 to 5 mins Hope this helps. Can i use can chickpeas ? I”m going to try your recipe it looks properly spiced and the last time I made homemade falafel with a different recipe I used canned, ab DS boy did that not work out great…. Dissolved in hot oil ? not good eats btw. Yes do try. Anytime before you fry the entire batch, just fry one to check if it dissolves. If it does, add more flour or bread crumbs to the mixture..
Hi. I am not sure anyone mentioned it but it would be helpful if you indicate if rhe 2 cups of chickpeas is dry/uncooked or tinned/cooked. I used 1 cup cooked chickpeas (I only wanted to make a small batch) but after mixing everything it looks like I can only make 4 lemon sized balls. So I think you meant here 2 cups of dry/uncooked chickpeas. Thanks! Yes it is 2 cups of raw or dry chickpeas. 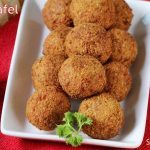 Falafel taste best with soaked chickpeas not cooked ones. Since I have given the recipe from scratch – soaking etc. It is dry chickpeas otherwise I would mention soaked chickpeas and would skip the step of soaking them. Thanks for the mention. I will update it more clearly.